If ticket prices got you thinking twice about a holiday in Zanzibar, know that it will soon get a lot cheaper. During its 2018/19 budget speech, the Zanzibar government announced plans to drop the stamp duty on air tickets in an effort to entice more travellers to Zanzibar, reports The Citizen. This is part of a new bid to boost job creation and grow the island's industries, specifically the tourism industry. Besides growing the tourism industry, Finance Minister Khalid Mohammed also noted that on Tanzania's mainland airport, the same levy is not imposed on international travel and thus aboloshing Zanzibar's stamp duty will harmonise taxes. Mango Airlines has direct flights to from Johannesburg to Zanzibar, but have told Traveller24 that they will first need to have in-depth discussions surrounding the update before they can comment on how it will affect their pricing. Can Zanzibar handle more tourists? However, The Citizen has questioned whether the island can handle an uptake in visitors. While tourism is a major contributor to the island's economy, it also poses the biggest threat to its environmental sustainability. According to Mohammed Sheikh, a professor from State University of Zanzibar and director of Life Science at the Tanzania Commission of Science and Technology, water usage and waste disposal are important issues that can be exacerbated by tourists if not managed correctly. He tells The Citizen that the average tourist consumes 10 - 15 times more water than the average local on Zanzibar, as well as produce more daily waste because tourism products are mostly packaged in single-use plastic. At the university, there's key focus on research and training in environmental health and marine ecosystems, where Zanzibarians can help develop more sustainable solutions for the island. South African travellers however will have no problems on keeping their water consumption low (we've had lots of practice), and the best part about a trip to Zanzibar? Tanzania is visa-free for Saffas, and that includes Zanzibar, even if it is semi-autonomous. While only Mango offers direct flights to Zanzibar, South African Airways and Kenya Airways has options for stop overs in either Dar es Salaam or Nairobi. Zanzibar's main island is Unguja, where most of its population live, and its surrounded by sandy white beaches perfect for water sports, snorkelling or just living that blissful beach life in the warm Indian Ocean waters. The most popular beaches are at Nungwi (believed to be the best), Kendwa, Paje and Kiwengwa, although holiday resorts have somewhat taken over Zanzibar's coastline. Paje Beach is a kitesurfing haven, Matemwe Beach doesn't have great swimming but smaller crowds, if you want to get acquainted with fishing communities Jambiani is your best bet and Kizimkazi has a great spot for seeing marine animals. Unguja's sister island is a little less crowded, a natural paradise broken up by small villages, the city of Chake Chake and clove plantations. Its beaches are dotted by baobab trees alongside azure seawater, or you can get lost in Ngezi Forest Reserve where you can try to spot the rare Pemba flying fox. The most popular time of year is September to January, although June at the start of the dry season is also a great time to skip the crowds and the heat. A drive through the centre of Zanzibar City, Stone Town presents an unfortunate picture of dilapidated buildings aged aggressively over time but still rich with culture; and with local businesses offering paintings by local artists, traditional outfits, spices and the usual ‘tourist’ fare like t-shirts and sarongs. 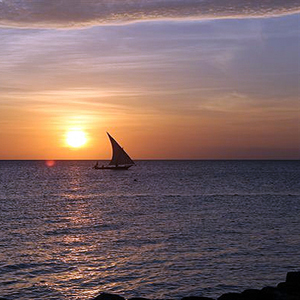 The area was designated a UNESCO site because of its cultural value as 'a fine example of the Swahili coastal trading towns of East Africa'. SEE: Have baby, will travel to Zanzibar! Zanzibar was once the spice capital of the world, and its farms are still producing the sweet aromas of clove, nutmeg and cinnamon. A spice tour is a must-do when visiting the islands where you'll have an opportunity to learn where all your Robertson spices come from. Not only will you see and hear how the spices are made, but most tours also give you the chance to taste and smell Zanzibar's spices, normally accompanied by a traditional Swahili meal. Zanzibar has some of the best snorkelling spots in the world, where you don't even need to go on a boat to check out the action. You can swim to many of the reefs right from the beach at low tide. One of the best spots to see the reefs is near Mnemba Island, but here you'll see more if you go diving. Other great spots include Tumbatu Island, the reef just off Kendwa Beach and the most visited coral reef is the one near Stone Town.